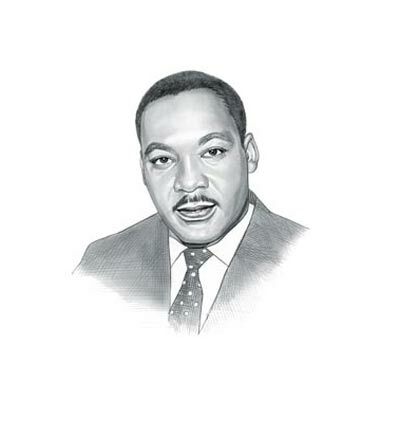 The Martin Luther King Speech - Beyond Vietnam featured is one of the great speeches by this famous, inspirational speaker. The Martin Luther King Speech demonstrates good oratory skills, a great public speaker with the ability to use clear words and text. Speech Example Topic / Subject Type: Inspirational / Inspiring Speech. Mr. Chairman, ladies and gentlemen, I need not pause to say how very delighted I am to be here tonight, and how very delighted I am to see you expressing your concern about the issues that will be discussed tonight by turning out in such large numbers. I also want to say that I consider it a great honor to share this program with Dr. Bennett, Dr. Commager, and Rabbi Heschel, some of the distinguished leaders and personalities of our nation. And of course it's always good to come back to Riverside Church. Over the last eight years, I have had the privilege of preaching here almost every year in that period, and it is always a rich and rewarding experience to come to this great church and this great pulpit. Some of us who have already begun to break the silence of the night have found that the calling to speak is often a vocation of agony, but we must speak. We must speak with all the humility that is appropriate to our limited vision, but we must speak. And we must rejoice as well, for surely this is the first time in our nation's history that a significant number of its religious leaders have chosen to move beyond the prophesying of smooth patriotism to the high grounds of a firm dissent based upon the mandates of conscience and the reading of history. Perhaps a new spirit is rising among us. If it is, let us trace its movements, and pray that our own inner being may be sensitive to its guidance, for we are deeply in need of a new way beyond the darkness that seems so close around us. Over the past two years, as I have moved to break the betrayal of my own silences and to speak from the burnings of my own heart, as I have called for radical departures from the destruction of Vietnam, many persons have questioned me about the wisdom of my path. At the heart of their concerns, this query has often loomed large and loud: "Why are you speaking about the war, Dr. King?" "Why are you joining the voices of dissent?" "Peace and civil rights don't mix," they say. "Aren't you hurting the cause of your people?" they ask. And when I hear them, though I often understand the source of their concern, I am nevertheless greatly saddened, for such questions mean that the inquirers have not really known me, my commitment, or my calling. Indeed, their questions suggest that they do not know the world in which they live. In the light of such tragic misunderstanding, I deem it of signal importance to try to state clearly, and I trust concisely, why I believe that the path from Dexter Avenue Baptist Church the church in Montgomery, Alabama, where I began my pastorate leads clearly to this sanctuary tonight. My third reason moves to an even deeper level of awareness, for it grows out of my experience in the ghettos of the North over the last three years, especially the last three summers. As I have walked among the desperate, rejected, and angry young men, I have told them that Molotov cocktails and rifles would not solve their problems. I have tried to offer them my deepest compassion while maintaining my conviction that social change comes most meaningfully through nonviolent action. But they asked, and rightly so, "What about Vietnam?" They asked if our own nation wasn?t using massive doses of violence to solve its problems, to bring about the changes it wanted. Their questions hit home, and I knew that I could never again raise my voice against the violence of the oppressed in the ghettos without having first spoken clearly to the greatest purveyor of violence in the world today: my own government. For the sake of those boys, for the sake of this government, for the sake of the hundreds of thousands trembling under our violence, I cannot be silent. And yet I swear this oath? Now, it should be incandescently clear that no one who has any concern for the integrity and life of America today can ignore the present war. If America's soul becomes totally poisoned, part of the autopsy must read "Vietnam." It can never be saved so long as it destroys the deepest hopes of men the world over. So it is that those of us who are yet determined that "America will be" are led down the path of protest and dissent, working for the health of our land. But even if it were not present, I would yet have to live with the meaning of my commitment to the ministry of Jesus Christ. To me, the relationship of this ministry to the making of peace is so obvious that I sometimes marvel at those who ask me why I am speaking against the war. Could it be that they do not know that the Good News was meant for all men for communist and capitalist, for their children and ours, for black and for white, for revolutionary and conservative? Have they forgotten that my ministry is in obedience to the one who loved His enemies so fully that He died for them? What then can I say to the Vietcong or to Castro or to Mao as a faithful minister of this one? Can I threaten them with death or must I not share with them my life? Finally, as I try to explain for you and for myself the road that leads from Montgomery to this place, I would have offered all that was most valid if I simply said that I must be true to my conviction that I share with all men the calling to be a son of the living God. Beyond the calling of race or nation or creed is this vocation of sonship and brotherhood. Because I believe that the Father is deeply concerned especially for His suffering and helpless and outcast children, I come tonight to speak for them. This I believe to be the privilege and the burden of all of us who deem ourselves bound by allegiances and loyalties which are broader and deeper than nationalism and which go beyond our nation's self-defined goals and positions. We are called to speak for the weak, for the voiceless, for the victims of our nation, for those it calls "enemy," for no document from human hands can make these humans any less our brothers. They must see Americans as strange liberators. The Vietnamese people proclaimed their own independence in 1954, in 1945 rather, after a combined French and Japanese occupation and before the communist revolution in China. They were led by Ho Chi Minh. Even though they quoted the American Declaration of Independence in their own document of freedom, we refused to recognize them. Instead, we decided to support France in its reconquest of her former colony. Our government felt then that the Vietnamese people were not ready for independence, and we again fell victim to the deadly Western arrogance that has poisoned the international atmosphere for so long. With that tragic decision we rejected a revolutionary government seeking self-determination and a government that had been established not by China?for whom the Vietnamese have no great love?but by clearly indigenous forces that included some communists. For the peasants this new government meant real land reform, one of the most important needs in their lives. After the French were defeated, it looked as if independence and land reform would come again through the Geneva Agreement. But instead there came the United States, determined that Ho should not unify the temporarily divided nation, and the peasants watched again as we supported one of the most vicious modern dictators, our chosen man, Premier Diem. The peasants watched and cringed as Diem ruthlessly rooted out all opposition, supported their extortionist landlords, and refused even to discuss reunification with the North. The peasants watched as all of this was presided over by United States influence and then by increasing numbers of United States troops who came to help quell the insurgency that Diem?s methods had aroused. When Diem was overthrown they may have been happy, but the long line of military dictators seemed to offer no real change, especially in terms of their need for land and peace. We have destroyed their two most cherished institutions: the family and the village. We have destroyed their land and their crops. We have cooperated in the crushing of the nation?s only non-communist revolutionary political force, the unified Buddhist Church. We have supported the enemies of the peasants of Saigon. We have corrupted their women and children and killed their men. Here is the true meaning and value of compassion and nonviolence, when it helps us to see the enemy?s point of view, to hear his questions, to know his assessment of ourselves. For from his view we may indeed see the basic weaknesses of our own condition, and if we are mature, we may learn and grow and profit from the wisdom of the brothers who are called the opposition. As we counsel young men concerning military service we must clarify for them our nation?s role in Vietnam and challenge them with the alternative of conscientious objection. [Sustained applause] I am pleased to say that this is a path now chosen by more than seventy students at my own alma mater, Morehouse College, and I recommend it to all who find the American course in Vietnam a dishonorable and unjust one. [Applause] Moreover, I would encourage all ministers of draft age to give up their ministerial exemptions and seek status as conscientious objectors. [Sustained applause] These are the times for real choices and not false ones. We are at the moment when our lives must be placed on the line if our nation is to survive its own folly. Every man of humane convictions must decide on the protest that best suits his convictions, but we must all protest. This call for a worldwide fellowship that lifts neighborly concern beyond one?s tribe, race, class and nation is in reality a call for an all-embracing and unconditional love for all mankind. This oft misunderstood, this oft misinterpreted concept, so readily dismissed by the Nietzsches of the world as a weak and cowardly force, has now become an absolute necessity for the survival of man. When I speak of love I am not speaking of some sentimental and weak response. I?m not speaking of that force which is just emotional bosh. I am speaking of that force which all of the great religions have seen as the supreme unifying principle of life. Love is somehow the key that unlocks the door which leads to ultimate reality. This Hindu-Moslem-Christian-Jewish-Buddhist belief about ultimate reality is beautifully summed up in the first epistle of Saint John: "Let us love one another, (Yes) for love is God. (Yes) And every one that loveth is born of God and knoweth God. He that loveth not knoweth not God, for God is love." "If we love one another, God dwelleth in us and his love is perfected in us." Let us hope that this spirit will become the order of the day. We are now faced with the fact, my friends, that tomorrow is today. We are confronted with the fierce urgency of now. In this unfolding conundrum of life and history, there is such a thing as being too late. Procrastination is still the thief of time. Life often leaves us standing bare, naked, and dejected with a lost opportunity. The tide in the affairs of men does not remain at flood?it ebbs. We may cry out desperately for time to pause in her passage, but time is adamant to every plea and rushes on. Over the bleached bones and jumbled residues of numerous civilizations are written the pathetic words, "Too late." There is an invisible book of life that faithfully records our vigilance or our neglect. Omar Khayyam is right: "The moving finger writes, and having writ moves on." Now let us begin. Now let us rededicate ourselves to the long and bitter, but beautiful, struggle for a new world. This is the calling of the sons of God, and our brothers wait eagerly for our response. Shall we say the odds are too great? Shall we tell them the struggle is too hard? Will our message be that the forces of American life militate against their arrival as full men, and we send our deepest regrets? Or will there be another message?of longing, of hope, of solidarity with their yearnings, of commitment to their cause, whatever the cost? The choice is ours, and though we might prefer it otherwise, we must choose in this crucial moment of human history. And the choice goes by forever ?twixt that darkness and that light. The text featured is in the form of extracts, passages or lines from the Martin Luther King Speech - Beyond Vietnam, an example of a great speaker. This famous Martin Luther King Speech is a great example of a clear address using excellent text to persuade and inspire the audience, a natural leader, speaker and motivator. Use this famous transcript of the Martin Luther King Speech - Beyond Vietnam as an example of a great speaker, oration and clear dialogue. This famous transcript of the Martin Luther King Speech originated from a historical manuscript. A Quote or extract from the Martin Luther King Speech - Beyond Vietnam, provides an illustration of, or allusion to, the famous events the era and the work of a great speaker. This famous Martin Luther King Speech is famed for its great powers of verbal communication making good use of the words and language to illustrate the subject all critical requirements of a great speaker. Whether this address can be described in the category of powerful, persuasive, motivational or inspirational the excellent powers of oration which are used make it one of the most famous speeches from a great speaker.